The protein, known as Jaws, also allows a larger volume of tissue to be influenced at once. The researchers described the protein in Nature Neuroscience. 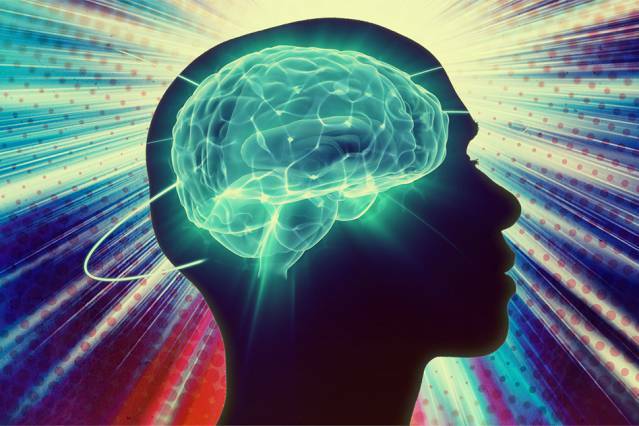 Optogenetics, a technology that allows scientists to control brain activity by shining light on neurons, relies on opsins, light-sensitive proteins that act as channels or pumps that influence electrical activity by controlling the flow of ions in or out of cells. Researchers insert a light source, such as an optical fiber, into the brain to suppress or stimulate electrical signals within cells. This technique requires a light source to be implanted in the brain, where it can reach the cells to be controlled. The neurons to be studied must be genetically engineered to produce the opsins. Also, inserting optical fibers into the brain “displaces brain tissue and can lead to side effects such as brain lesion, neural morphology changes, glial inflammation and motility, or aseptic compromise,” the researchers say in the paper. In addition, such implants can be difficult to insert and can be incompatible with many kinds of experiments, such as studies of development, during which the brain changes size, or of neurodegenerative disorders, during which the implant can interact with brain physiology. And it is difficult to perform long-term studies of chronic diseases with these implants. Most of the natural opsins now used for optogenetics respond best to blue or green light. Boyden’s team had previously identified two light-sensitive chloride ion pumps that respond to red light, which can penetrate deeper into living tissue (red light is less absorbed by hemoglobin, myoglobin, and lipid than blue, green, or yellow wavelengths). However, these molecules, found in the bacteria Haloarcula marismortui and Haloarcula vallismortis, did not induce a strong enough photocurrent — an electric current in response to light — to be useful in controlling neuron activity. So graduate student Amy Chuong set out to improve the photocurrent by looking for relatives of these proteins and testing their electrical activity. She then engineered one of these relatives by making many different mutants. The result of this screen, the “Jaws” protein, retained its red-light sensitivity but had a much stronger photocurrent — enough to shut down neural activity. “This exemplifies how the genomic diversity of the natural world can yield powerful reagents that can be of use in biology and neuroscience,” says Boyden. Using this opsin, the researchers were able to shut down neuronal activity in the mouse brain with a light source outside the animal’s head. The suppression occurred as deep as 3 millimeters in the brain, and was just as effective as that of existing silencers that rely on other colors of light delivered via conventional invasive illumination. Working with researchers at the Friedrich Miescher Institute for Biomedical Research in Switzerland, the MIT team also tested Jaws’s ability to restore the light sensitivity of retinal cells called cones. In people with a disease called retinitis pigmentosa, cones slowly atrophy, eventually causing blindness. Friedrich Miescher Institute scientists Botond Roska and Volker Busskamp have previously shown that some vision can be restored in mice by engineering those cone cells to express light-sensitive proteins. In the new paper, Roska and Busskamp tested the Jaws protein in the mouse retina and found that it more closely resembled the eye’s natural opsins and offered a greater range of light sensitivity, making it potentially more useful for treating retinitis pigmentosa. This type of noninvasive approach to optogenetics could also represent a step toward developing optogenetic treatments for diseases such as epilepsy, which could be controlled by shutting off misfiring neurons that cause seizures, Boyden says. However, since these molecules come from species other than humans, “many studies must be done to evaluate their safety and efficacy in the context of treatment,” he says. Boyden’s lab is working with other research groups to further test the Jaws opsin for other applications. The team is also seeking new light-sensitive proteins and is working on high-throughput screening approaches that could speed up the development of such proteins. The research at MIT was funded by Jerry and Marge Burnett, the Defense Advanced Research Projects Agency, the Human Frontiers Science Program, the IET A. F. Harvey Prize, the Janet and Sheldon Razin ’59 Fellowship of the MIT McGovern Institute, the New York Stem Cell Foundation-Robertson Investigator Award, the National Institutes of Health, the National Science Foundation, and the Wallace H. Coulter Foundation. MIT | Associate Professor of Biological Engineering and Brain and Cognitive Sciences Ed Boyden explains optogenetics and how it is used in neurological research.